The project Play4Privacy (P4P) explains Blockchain technology by playing games in the public space and thereby collects money for privacy organisations like epicenter.works and the new NGO of Max Schrems. In the first two days more than 10,000 Euros (38.18 Ether) have been collected. The fundraising continues until November 15th 2017. Whereas cryptocurrencies like Bitcoin are on everyone’s lips, hardly anybody understands the underlying technology Blockchain, which not only offers ways to build decentralised peer-to-peer payment networks, but could potentially eliminate any central authority running an online service such as a social network or chat application. This October the Blockchain incubator lab10 collective, based in Graz, Austria introduced the Blockchain and its paradigms to a wider audience in a – literally – playful manner. “Our goal is to improve the understanding of Blockchain in the population”, explains Thomas Lechner, product owner of Play4Privacy. Each game (like Chess or Go) can be seen as a succession of decisions, which – once made – cannot be reversed. The same is true for the Blockchain. As soon as a decision is made (consensus), it is added to the Blockchain as a new block, and can never be changed again (finality). Consensus and finality are two of the main principles of the Blockchain, along with transparent anonymity. 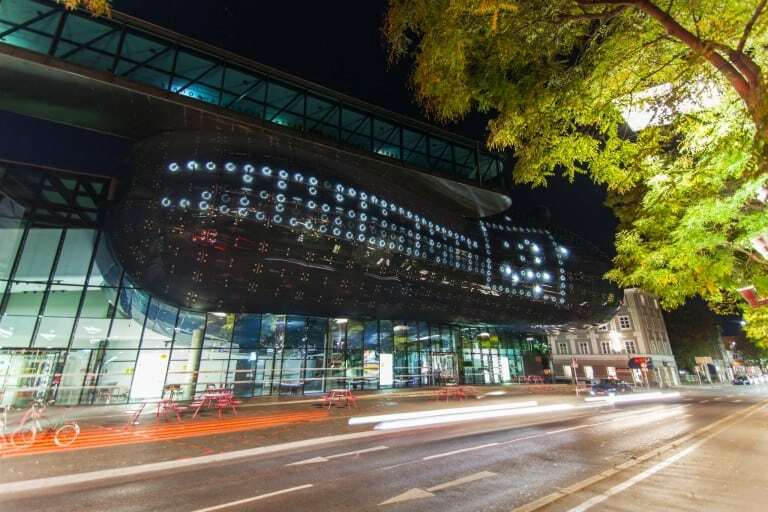 To demonstrate the latter, the team around Thomas turned the light-facade of the Museum of Modern Art in Graz into a game board for the strategy game Go. Every evening, people from all over the world, split into two teams, played online. Based on a consensus-generating algorithm, each team placed their stones. All players who participated in deciding the next move earned a reward: a so-called PLAY-token that doubles as a crypto-currency. All moves were transparently shown on the lit-up museum façade as well as on the live-stream and thus visible for everyone. In this manner, players as well as spectators get to experience how the Blockchain works – namely as an anonymously distributed network with a public database that is difficult to be cheated, but which is still not subject to central control. As part of the concept, for every token mined, a supplement coin is generated to be distributed to donors supporting charity organisations fighting for privacy. In the course of the last four weeks, a pool of almost half a million PLAY tokens was collected and is ready to be shared amongst all supporters of Play4Privacy. 100% of the collected funds go to the NGO epicenter.works (https://epicenter.works/) and the new organisation founded by Max Schrems, an Austrian lawyer, author, and privacy activist who became known for campaigns against Facebook for privacy violation. “Privacy is a fundamental right. Europe has stringent privacy laws, but we lack enforcement. With our new project we would like to close this gap and apply the method of strategic litigation to bring privacy to the people.”, says Max Schrems with regards to the project and its goal to create awareness for privacy.